Photo provided by Eva Kisgyorgy. Lednice-Valtice Cultural Landscape is an artifical landscape that evolved during the Enlightenment under the guidance of the House of Liechtenstein. The design started in the 17th century with the creation of avenues connecting Valtice with other parts of the estate. During the 18th century a framework of avenues and paths providing vistas and rides was developed, imposing order on nature in the manner of the Renaissance artists and architects. In the 19th century major projects were started: the landscape became fashioned according to English romantic principles of landscape architecture under supervision landscape artist Bernhard Petri. These two localities are connected by Bezruè Avenue. There is also one more village in the park - Hlohovec. The surrounding area is covered with pines, ponds and holds numerous bigger or smaller pavilions scattered throughout the whole complex, often serving as hunting lodges. Baroque and Romantic elements are mingled. What is the ‘worst’ WHS? According to the ranking of most popular sites on this website, Kuk in PNG is currently rated the lowest among our community members - although it has only 1 vote and few have been there at all. Among the more frequently visited ones, Battir and Srebarna stand out negatively. Well – regarding the WHS visited by me I have just reached an all-time low: I gave Lednice-Valtice Cultural Landscape a 3 out of 10, which in my personal conversion table translates to 1 star. Even less than the little inspiring Srebarna where I was a month ago…. The number of photos: I took 23 in total of Valtice, of which 9 made it into my Flickr album which I use as a back-up for the photos that I like to keep. At Valtice there is just little that captures your eye. My personal record at the other end of the spectrum by the way is for Machu Picchu, where I took over 400 photos in a single visit! I cannot see its OUV: Lednice-Valtice’s OUV statement is full of hollow phrases, such as “bringing together in harmony cultural monuments from successive periods” and “served as a model throughout the Danube region” (seems regional to me). In the end it is a designed landscape by an aristocratic family from the 18th century. The same century already gave us the much grander Potsdam, Drottningholm and Caserta for example! The visitor experience: a number of landscape elements that might have been of interest were closed, either for an undisclosed period of time or temporarily for the winter season. These include follies such as a grotto (no longer accessible), a frog cellar (closed with a lock), the colonnade (no access in winter season?) and the St. Hubertus Chapel (requires a 5km walk and who knows what you will find at the end of that?). Both Lednice and Valtice castles are right in the middle of a town and parking is a nightmare too. Valtice castle looks tired and the hotel in one of its wings is under scaffolding at the moment. In its defence it must be said that Valtice was the 3rd Czech castle-garden WHS that I visited in a row, so maybe if I had seen this one first it would have been a better experience (although Litomysl for me certainly stands out because of its originality). There are also bike trails that cross the cultural landscape between Lednice and Valtice, which can be a nice way of experiencing this area. Or maybe Lednice is more interesting than Valtice…. While I was planning my trip to Eastern Czechia, I was fed up to note that at least three palaces were on World Heritage List, Litomysl, Kromeriz and Lednice-Valtice, and I determined that to escape from this noble bombardment, only exterior of these palaces were enough for me. From Brno, it was just an easy drive to reach large landscape of Lednice-Valtice. I directly drove pass Lednice to the town of Valtice first. There was a straight road connecting these two towns, at first I expected to see beautiful landscape similar to Loire Valley or Versailles since many reviewers praised its beauty, but what I saw was an uninspired area of typical vineyards, dense forest and modern villages that I hardly believed to a fine example of man-made landscape, I did make a detour to see some famous follies along the lake shore; for example, Temple of three graces, but again nothing special which made me disappointed greatly. However, when I reached Valtice, I was impressed with its townscape with lovely and harmoniously buildings. The star of this pretty town was its castle, while overall architecture was quite boring with typical Austrian baroque that could be found everywhere in former Austro-Hungarian territory, its front courtyard with stately stairs and two sculpture was perfectly designed, and I did a quick look at the castle’s chapel, its ceiling was just beautiful. Then I drove back to Lednice Castle, the main estate of Liechtenstein family of this domain. Its yellowish gothic exterior was quite impressive as it was really stunning and so different from baroque Valtice. Too bad that the layout of the castle and front garden was a bit confusing, from the car park entrance, the castle seemed to have two front courtyards with chapel in the middle of those courtyards making this castle like a big “M” letter. With these strange layout, the real entrance of this complex looked downgrade which contradict to typical landscape design. I walked to see the greenhouse which was attached to the castle. The greenhouse was lovely and quite interesting for its design and the surrounded French garden landscape was very standard. Then I walked to the rear gardens, this area was truly a highlight of Lednice-Valtice area. 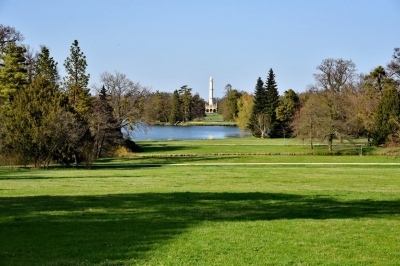 The landscape design of large English garden was quite impressive with genius mix of large lawn, lakes, dense forest and Islamic minaret as main folly. I leisurely walked to the minaret and backed to the castle, a well recommended with landscape garden enthusiast. In my opinion it possibly the best landscape garden in this region. I ended my trip with tasty food at local restaurant called U Korunky, its pork tenderloin and chocolate cake was quite classic. The Lednice Castle and front courtyard of Valtice Castle were a highlight of this World Heritage Site in my opinion. While I could find similar royal/noble landscape in other parts of Europe, Lednice-Valtice was a really fine landscape, far better than many listed gardens in Germany, surprisingly nicer than royal Schonbrunn in Vienna or even Aranjuez in Spain where I visited a couple of months later. The only thing I felt with Lednice-Valtice was that the landscape was still pristine since its located far from any big city which could not be found in similar landscape of Potsdam. At least my initial concern that three castles of Moravia would bore me did not happen as these castles at least for exterior was totally different, Valtice and Kromeriz were quite similar actually, and made me happy to visit this place. We visited this UNESCO World Heritage Site in a day trip from Bratislava. We started at the Valtice castle and we were there like 10:15 AM, tours started each full hour so we had 45 minutes to check around the castle and have a drink. It would have been better to catch the 10 AM tour as we later found at we got into a small hurry. What we liked (on all things in this area) is that you can pay a few euro to be able to make photo’s inside. We did this of course and it was funny that people who did not pay got warnings for making photo’s and we could openly photograph all without problem :-) All the small sights we kind of just drove too; this was not really the intention of the roads as most people explore all on bicycles; but at the end of the day we got into shortage of time so we just drove over the small (sometimes unpaved) roads – this was after 5PM and there was not many people but we did get looked at a few times. The whole area is a landscape made during the 17th century throughout the 19th century by the Liechtenstein Royal Family. The two main parts are Valtice Castle and Lednice castle plus around some smaller buildings. Our first stop was the Valtice castle; this was a good choice as most other things are more close to Lednice. Valtice castle started in the 12th century as a medieval castle. It was rebuild several times and in the second half of the 16th century turned into a Renaissance castle which was partly destroyed by the Swedes and after renovated in a Baroque style. The original gardens were turned into a natural landscape in the 19th century. 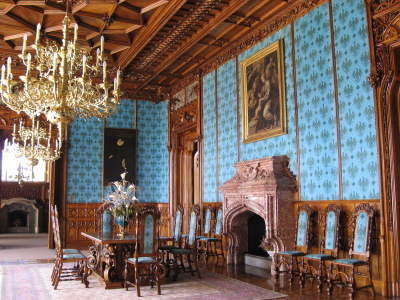 Inside the castle beautiful rooms and decorations remain – do not miss the tour inside! From this castle it’s about a 5 minute drive to the Kolonada which gives you a great view over the city; it was used as a viewpoint. From here we drove to Lednice for a lunch and after we went to the castle. Here, there is several tours, which will take around 3 hours of your time! We didn’t know this and the only way to see the insides is WITH the tour. We saw the children rooms (1 tour) which are on level 2 and two tours, ground level and level 1. Also this castle was first a medieval castle and turned into a castle like it’s now in the 17th century by the Royals of the Liechtenstein Family which owned the places will the end of WWII. It was build as a summer mansion for the family and modernized during time and even central heating (on hot airflow) was added; also the church was added at a later stadium. See the gallery for an impression. Then there are some buildings which are actually smaller; we drove to all. See also the map below the gallery what we drove (zoom on the top part as the bottom is the drive from Bratislava). We checked out the Kolonada (see under Valtice) from Lednice the Minaret and Obelisk (Obelisk only from far distance), Temple of Apollo, Three Graces, Chapel of St Hubert, Rendez-Vous (Temple of Diana). There are a few others which we saw from a distance because they are privately owned or under construction and no direct visit possible. The Lednice-Valtice cultural landscape is a large, man-made landscape designed by the Liechtenstein family according to the principles of the English landscape architecture. To call it just a park would be an understatement. The main sites are the two castles in Lednice and Valtice, about 10 km apart, but the core zone also includes about 15 small buildings: small castles, temple, colonnades, a minaret, etc. Some of them are open to the public. We arrived at Lednice on a Monday morning, thus the question if we should take a guided tour to the castle didn't arise (like almost everywhere in Europe guided tours are not available on Mondays). Furthermore, it was a sunny, warm day, so we decided to rent bikes (in Lednice) and to explore the landscape. We cycled the whole day through forests and around ponds and we visited almost all of the small buildings in the area, only Pohanska and Lany were too far away. We have enjoyed our bike tour very much. The routes between the buildings are partially bumpy dirt roads, thus the best is to rent a mountain bike. The terrain is flat almost everywhere, only the route to the Colonnades south-west of Valtice goes uphill through the vineyards. But the effort is worthwhile, it is one of the most beautiful buildings of the WHS. We also liked the Minaret, the Three Graces and the Apollo Temple. Most of the buildings are in good condition, it seems that there have been some restorations since 2006, the review by David Berlanda. At least the Temple of Diana (photo) appears to have been recently renovated, and also the Temple of Apollo. But the New Court is still in very bad condition. The castles of Lednice and Valtice are very different. Lednice is built in neo-Gothic style, it has recently been renovated. With the bright yellow colour and the extensive decorations it looks like a fairy-tale castle. 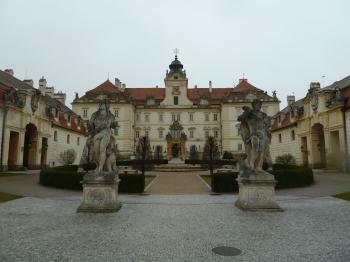 Valtice Palace is built in Baroque style and is also home of the Czech National Wine Institute. I truly can support the recommendation of Ian Cade to sample the local wine, it's worthwhile. We had accommodation at the Garni Hotel Plavební, located next to the Lednice park, the back door of the hotel area leads directly in the park. A walk through the park in the morning mist was a perfect end of our visit. All in all, I did not expect too much from Lednice-Valtice, but it turned out to be a pleasant surprise. This site had been a thorn in my side for a few years. 3 previous attempts to visit were abandoned, and it sat there taunting me for not 'completing' all the WHS in the Czech Republic. However a trip between Olomouc and Vienna in early 2012 provided me with a great opportunity to finally 'tick it off'. My first stop was Valtice, a rather pleasant small town with a monumental palace. Most of the things in the city centre and in the castle grounds were closed this early in the year. This fortunately spared me a tour around the palace interior. I've seen enough Central European dancing parlours, tapestries and chandeliers to last several lifetimes, so I was exceptionally happy to find a locked door to the ticket hall (it may just have been a little stiff to open, but I really didn't want to have a look around). Instead I headed down into the cellars of the palace that now provide a home to the Czech national wine institute. And I had a lovely time walking around looking at and sampling the massive selection of wines and exploring a different part of the castle’s architecture. The surrounding landscape is actually the centre of the Czech wine industry, and whilst it is not as well developed as many other wine regions in Europe it does produce some great quality affordable wines. My recommendation would be to try some of the locally produced Veltlínské zelené (aka Grüner Veltliner) or if you are there in the late summer early autumn you could try the young wine Burčák. After sampling the local produce, I hoped on the hourly bus that travels for 20 minutes to Lednice. The surrounding countryside wasn’t at its best in mid-winter, however I think this would be a lovely place to cycle around in warmer months. 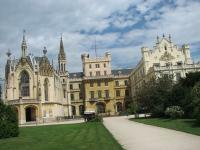 The palace at Lednice is an impressive neo-gothic pile, which has recently been restored. The intricate exterior is rather impressive and rewards closer inspection. Again the interior was closed so I decided to head off into the grounds in search of the famous folly in the shape of a minaret. I enjoyed my walk around the grounds, but again a trip in summer would be much nicer, as there are pleasure boats and other activities going on that would make this an excellent place to while away a lazy sunny afternoon. The palace at Lednice is the nicer of the two though I would say Valtice was the more pleasant town, and it also houses the lovely wine institute. Access is easy from the unassuming industrial town of Břeclav, which is straightforward to reach as it is on the main train route. I was happy to finally tick of this site, though if you want to get the best out of it I would recommend a visit during warmer weather. The cultural landscape around the southern Moravian castles of Lednice (Eisgrub) and Valtice (Feldsberg) is one of Europe's largest, the product of centuries of care by the Liechtenstein family. Both castles are very nice - at least from the outside, since you had to take a guided tour to see them, and these were evidently only in Czech... Anyway, the gardens and ponds are really very nice for a relaxing stroll and going there makes a great daytrip from Vienna (only about an hour or so by train). I have been many times in this beautiful landscape, which in reality is a huge park in Baroque and English romantic style (200 sq. km) created between the 17th and the 20th century by dukes of Liechtenstein and projected by Bernard Petri and Josef van der Schot. The castle of Valtice was the Liechtensteins’ residence, a masterpiece of Baroque architecture (originally in Renaissance and Mannerist styles), projected by Johann Bernhard Fischer von Erlach, Giovan Giacomo Tencalla, Giovanni Battista Carlone, Domenico Martinelli and Anton Johann Ospel, with rooms containing the original furniture and paintings, the theatre and the chapel. Very interesting is also the town centre with a big square, the church of the Assumption of the Virgin Mary, the church of St. Augustine with the convent, the Column of the Virgin, a fountain, the old hospital, the Franciscan convent, a gate, the town hall and the Chapel of St. Joseph. The castle of Lednice is a neo-classical and neo-Gothic building (originally in Renaissance and Baroque style), projected in the centuries by Tencalla, Carlone, Giovanni Maria Filippi and Joseph Kornhäusel, with rooms in Tudor style, a huge glasshouse and stables projected by Fischer von Erlach. 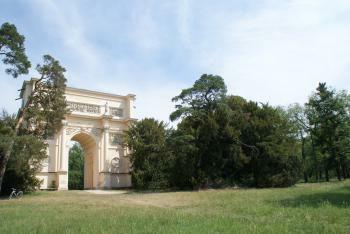 In the Lednice - Valtice park are a lot of ponds created by the river Dyje and native and exotic trees. The greatest variety of them (different for form, height and colours) is around the two main residences and along the banks of the ponds; there are also copses and individual trees around and within the meadows, straight lines of trees and roads lined with groups of them. There are also about 15 small building, projected by Hardmuth, Kornhäusel, Engel and Joseph Popellach in romantic style situated on high points, or in the centre of major routes, or on a border or boundary. There are beatiful views from some of that to the others (the dominant elements are the Minaret and the Colonnade); some of the buildings have a facade and a background of greenery, so they must be viewed only from one direction, but others don't have one front in particular so are interesting the views from many directions. A lot of them are imitations of buildings of various cultures: the Minaret, an Islamic building, the Janohrad, small castle constructed as a medieval ruin, the Temple of Apollo, imitation of a classical temple, the Temple of Diana, built like a Roman arch, a Roman aqueduct, an Egyptian obelisk, a classical colonnade (Rejstna), the Tøi Grácie colonnade, the New Courts, the St. Hubertus chapel, the castles Belvedere, Hunting, of Boundaries, of Pond, Lány and Pohansko. At Pohansko there was a great-Moravian hillfort(9th - 10th century), 28 hectares big, with the court of the ruler, houses, tombs and the still visible church and 2km long walls. I liked very much this cultural landscape and especially the two castles because of the quality and the variety of the architecture and of the landscape design; also the minor buildings are very interesting. The autenticity of the cultural landscape is very high, even if the castles have different building phases and aren't only in Romantic style but also older. The main building are quite well conservated but some of the minor buildings are in very bad conditions (Temple of Apollo, Temple of Diana, New Courts, Belvedere Castle, Hunting Castle, Lány Castle). They need urgent restoration works and fortunately they are in course on some of this buildings. I think it will be better to eliminate some highly inappropriate modern elements (wooden tympanums, modern windows destroying old doors and windows) of some buildings. The cultural landscape justifies the inscription because it is a masterpiece of the park design in English style and it is worth to be visited. Lednice and Valtice castles are easy to reach from the exits of the highway D2 going from Brno to Bratislava and you can park directly in front of them; there are guided tours but only in Czech. You can arrive to some of the minor buildings by car (don't be scared to take some roads where is forbidden to drive, there won't be controls), but you must have a very detailed map of them. If you want to see the other buildings you must walk in woods for a maximum of four km, but you have to know where are the nearest parkings to this buildings. Some of them are open with guided tours in Czech, some without and some are closed. The Lednice-Valtice Cultural Landscape is sometimes described as "the pearl of South Moravia' and even if the two castles - once the domains by the Dukes of Lichtenstein - are impressing, its is the parks, the forests and the landscape that strikes you the most. A gigantic English park surrounds the Lednice castle, filled with lakes, rivers and fanciful buildings like artificial ruins - temples, walls and sculptures that surprise you as you stroll through the park. The small river Thaya flows gently through the landscape and on a warm summer day there is nothing better than to spend a couple of hours on a small river boats from where you have one the best views over this splendid central European river and forest landscape. The Lednice-Valtice landscape takes days to visit and though if I've read several different figures on the size of it, it is recommendable to rent yourself a bike if you want to see as much as possible. It's a place that I will remember for long and recommend to fellow travelers. Baths: There used to be a vapour bath in the Wasserwerk. Liechtenstein Family: Valtice used to be the principal seat of the Liechtenstein family until World War II. 146 Community Members have visited.